The spin-magnetic moment of the electron is revisited. In the form of the relativistic quantum mechanics, we calculate the magnetic moment of Dirac electron with no orbital angular-momentum. It is inferred that obtained magnetic moment may be the spin-magnetic moment, because it is never due to orbital motion. A transition current flowing from a positive energy state to a negative energy state in Dirac Sea is found. Application to the band structure of semiconductor is suggested. The spin and the spin-magnetic moment are basic and the most important concepts in the spintronics  that is new research field in considerable expansion. In the previous work  , we found that the spin-magnetic moment seems to be caused from well-known definitional equation of magnetic moment. Such a case never happen in the non-relativistic quantum mechanics. In the relativistic quantum mechanics, however, the electron has another degree of freedom called Zitterbewegung  - that is trembling motion of relativistic electron. Some physical connection between the spin-magnetic moment and Zitterbewegung was implied in the previous work  . more easily than the previous work  , where denotes expectation value of z-component of spin-magnetic moment of a free Dirac electron in positive energy state. In relativistic quantum theory, however, we should mind that we can not use Equation (5) for Dirac electron, because the velocity and the momentum are independent variables to each other (i.e. ) in this case  . Taking , we have the above relation in another form. from Equations (15) and (14). Because each component of satisfies , takes the eigenvalues and . This means the velocity also has two eigenvalues , that is the speed of light. However, states are not eigen states of . An explicit form of in the next section is applicable to the states . In actual calculation, we will take z-axis along the momentum of the electron: . This procedure is necessary in order to not only simplify our calculation but also exclude the z-component of angular momentum caused by orbital motion of the electron. The velocity operator is divided into two parts. from Equation (16). The velocity is Zitterbewegung part which includes oscillation factor, and corresponds to uniform velocity. 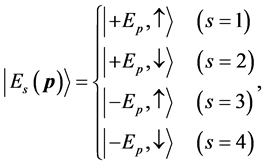 The coordinate operator is also easily calculated from corresponding part of the above equations. where is an integration constant, and agrees to an initial point of the electron in classical sense. Remembering that is equal to the original of Equation (7), we easily calculate the expectation value of for in our frame, by the use of relations in Sections 3 and 4.
where is used. Arbitrary constant can set to zero without loss of generality. The similar results occur for x and y components of both and . The contribution from uniform velocity vanish at this time because of . where the expression of the expectation value for is simplified. Results (38)-(46) indicate that Zitterbewegung (trembling motion) phenomenon for relativistic electron is un-observable effect in the sense that the expectation values of physical quantities always agree to classically measured one in accordance with Ehrenfest’s law  . A question whether Zitterbewegung works or not in actual physics phenomena then arises. The answer will be shown in the next section. for relativistic electron. It is our advantage that we need no external magnetic field. In what follows, we pay attention to the electron in state , and to the z-component of the magnetic moment. we have an expression of the expectation value of . We have also Zitterbewegung part of the velocity. which is the same result as in the previous work  . where is the spin matrix operator. where means the energy gap of Dirac Sea in vacuum. This agrees with the frequency of Zitterbewegung (See Equations (57) and (58)). Figure 1. Spin-magnetic moment caused by transition current. , and the latter is the spin-magnetic moment with . In other word, the spin-magnetic moment may be caused not by usual electric current but by some new current which yield when the electron undergoes transition between two states of positive and negative energies. It should be noted that even an electron at rest (i.e. and ) in space is able to yield this new current. where and are the Dirac matrices. The above Hamiltonian agrees completely to the Dirac Hamiltonian in Equation (7) if we replace by , and by . Obeying the Heisenberg equation of motion, it is then predicted that of the equal form reproduces the same results obtained here with the replacements and . 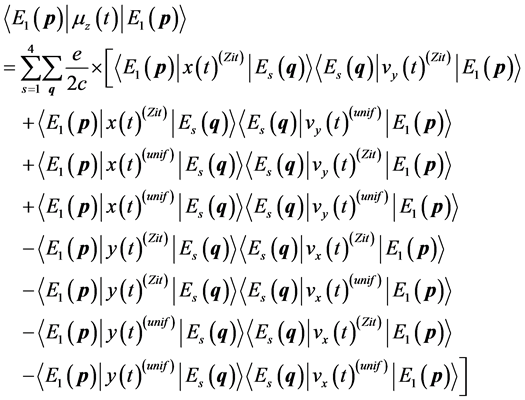 They will appear as a change of -factor of the electron in semiconductor from new equation corresponding to Equation (59). Schrödinger, E. (1930) Sitzungsber. Preuss. Akad. Wiss. Phys. Math. Kl., 24, 418-428. Rusin, T.M. and Zawadzki, W. (2007) Physical Review B, 76, 195439. Dirac, P.A.M. (1958) The Principle of Quantum Mechanics. Oxford University Press, Section 70. Schiff, L.I. (1968) Quantum Mechanics. McGraw-Hill, Section 43. Jackson, J.D. (1975) Classical Electrodynamics. John Wiley & Sons, New York, Section 5.6. Landau, L.D. and Lifschitz, E.M. (1975) The Classical Theory of Fields. Pergamon Press, Section 44. Dirac, P.A.M. (1958) The Principle of Quantum Mechanics. Oxford University Press, Section 67-69. Schiff, L.I. (1968) Quantum Mechanics. McGraw-Hill, Section 7. Sasabe, S. and Tsuchiya, K. (2008) T. IEE Japan A, 128, 313-314.